Refrigerate leftover oil to use as a dressing to drizzle over grilled fish or summer vegetables. Garnish with whole fresh chives, if desired. Combine first 5 ingredients in a food processor; add 1/4 teaspoon salt. Process until finely chopped. 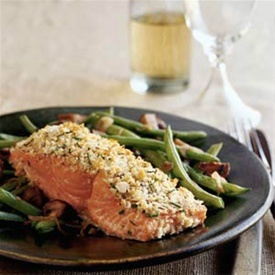 Sprinkle salmon with the remaining 1/4 teaspoon salt and pepper. Top fillets evenly with breadcrumb mixture; press gently to adhere. Place fillets on a baking sheet coated with cooking spray. Bake at 400° for 10 minutes or until fish flakes easily when tested with a fork or until desired degree of doneness. Serve with lemon wedges. Preheat oven to 350°.. Grease and flour 9x5" loaf pan. Mix brown sugar and cinnamon in a bowl - set aside. Beat white sugar and butter together with mixer until smooth and creamy. Beat in eggs, one at a time. Add vanilla extract. Combine flour and baking powder together in another bowl; stir into creamed butter mixture. Mix milk into batter until smooth. Pour half batter in to pan. Next add half the apples and half the brown sugar cinnamon mixture. Lightly pat apple mixture into batter. Pour remaining batter over apple layer. Top with remaining apples and add more brown sugar/cinnamon mixture. Lightly pat apples into batter; swirl brown sugar mixture though apples using knife. Bake about 30-40 mintes until toothpick inserted into center of loaf comes out clean. Combine all ingredients and mix well. Chill until ready to serve. Serve with crackers or vegetables. In tightly covered container, shake all vinaigrette ingredients. In 2 qt saucepan, place potatoes; add enough water to cover. Add 1/2 tsp salt. Cover and heat to boiling. Reduce heat to love and cook covered about 15 mins or until potatoes are just tender. Drain, cool slightly. Cut potatoes in half. Toss gently with 1/2 tbsp oil. Heat coals/gas grill for direct heat. 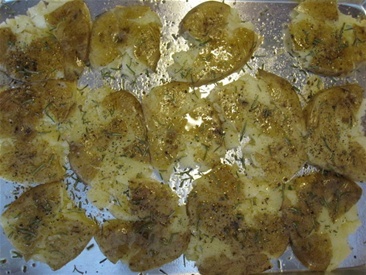 Cover and grill potatoes over medium heat 5-10 minutes., turning occasionally until golden brown and tender. In large bowl, toss potatoes, bell pepper, olives and vinaigrette. Brush zucchini, squash and pepper halves with olive oil. Sprinkle with salt and pepper. Preheat gas grill. Reduce heat to medium. Place vegetables on rack directly over heat. 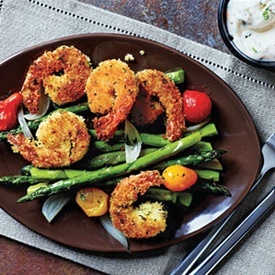 Cover and grill for 6-8 mins or until vegetables are crisp-tender, turning once halfway through grilling. Remove from grill and cool slightly. Chop grilled vegetables. 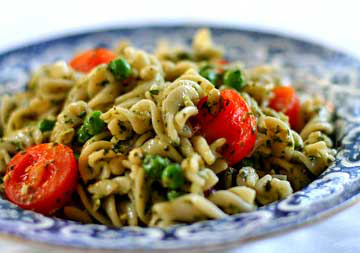 In medium bowl, combine chopped veggies, tomato, mayo, pesto, basil and oregano. Place tortillas on grill rack directly over heat. Cover and grill for 1-2 mins or until lightly toasted on one side. Turn tortillas over and spread veggie mixture over toasted sides of tortillas. Sprinkle with shredded cheese. Cover and grill for 2-3 mins more or until tortillas are lightly toasted, veggies are just heated and cheese begins to melt. Carefully remove from grill. To serve, cut into quarters. NOTE: This dish needs to be prepared 1-4 days ahead of serving. Arrange half of cucumber in a 9 inch pie plate, Top with half o onion. Repeat procedure with remaining cucumbers and onions. Combine vinegar and next 5 ingredients (vinegar through chiles) in small saucepan. Bring to boil. Cook 1 minute or until sugar dissolves,stirring constantly. Pour hot vinegar mixture over cucumber mixture. Cover and marinate in refrigerator 1-4 days. Arrange tomato slices on a platter. Sprinkle evenly with salt and pepper. Remove cucumbers from marinade with a slotted spoon. Arrange over tomato slices. Cut cucumbers in half lengthwise and scoop out seeds with a small spoon. Slice thin. Place cukes in a bowl. In another small bowl. combine vinegar, mustard, salt, pepper and wish together. Whisk in the oils and dill. Taste and adjust seasonings accordingly. Serve right away or refrigerate up to 30 minutes and serve. Whisk together mayonnaise, garlic and both mustards in small bowl. Season with salt and pepper. Cover the aioli and refrigerate for at least 30 minutes and up to 1 day. Put potatoes in a pot, cover with cold water by 2 inches and add 2 tbsp salt. Bring to a boil over high heat and cook until a skewer inserted into the center of a potato meets some resistance, 15 to 20 minutes. Drain well and let cool slightly. Put the potatoes in a large bowl, toss with the aioli and season with salt. Grill until golden brown on all sides, about 8 minutes. Transfer potatoes to a patter, sprinkle with the fresh herbs and season with salt and pepper. Heat olive oil in a large saucepan an saute onion and garlic for 5 mins or until translucent. Add broth, vinegar, salt and red pepper. Bring mixture to a boil and add white beans, carrots, potatoes and kale. Return to a boil, then reduce to medium heat. Cook for 1 minutes, or until vegetables are tender. Ladle into individual soup bowls. Squeeze juice from lemon into each. Serve with a green salad and crusty bread. NOTE: This recipe is designed to work with potatoes 1 1/2 to 2 inches in diameter...do not use potatoes any larger. It is important to thoroughly cook the potatoes so that they will smash easily. remove the potatoes from the baking sheet as soon as they are done browning -- they will toughen if left too long. A potato masher can also be used to "smash" the potatoes. Adjust oven rack to top and bottom position and heat oven to 500 F. Arrange potatoes on rimmed baking sheet, pour 3/ cup water into baking sheet and wrap tightly with aluminum foil. Cook on bottom rack until paring knife or skewer slips in and out of potatoes easily...poke through foil to test, 25-30 minutes. Remove foil and cool 10 minutes. If any water remains on sheet, blot dry with paper towel. Drizzle 3 tsp oil over potatoes and roll to cat. Space potatoes evenly on sheet and place second baking sheet on top; press down firmly on baking sheet, flattening potatoes until 1/3 to 1/2 inch thick. Sprinkle with thyme, season with salt and pepper to taste, and drizzle evenly with remaining 3 tbsp of olive oil. Roast potatoes on top rack for 15 minutes, then transfer potatoes to bottom rack and continue to roast until well browned, 20-30 minutes longer. Serve immediately. Put potatoes in saucepan with cold water to cover and bring to a boil. cook for 20-25 minutes or until easily pierced with sharp knife. Drain and set aside. In saucepan of boiling water, blanch snow peas for 1-2 minutes or until crisp-tender; refresh in cold water and drain. 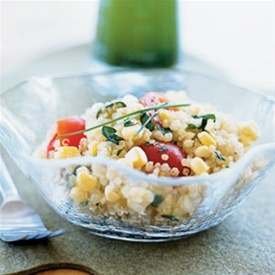 Place in serving bowl, along with pesto, onions, red and green peppers, corn, green onions, pine nuts and lemon juice. Brush zucchini, squash and pepper with olive oil. Sprinkle with salt and pepper. Preheat gas grill. Reduce heat to medium. Place veggies on rack directly over heat. Cover and grill for 6-8 minutes or until vegetables are crisp-tender, turning once halfway through. Remove and cool slightly. Chop grilled veggies. In medium bowl, combine chopped veggies, tomato, mayo, pesto basil and oregano. Place tortillas on grill rack directly over heat. Cover and grill for 1-2 minutes or until lightly toasted on one side. Turn tortillas over and spread the veggie mixture over toasted side. Sprinkle with shredded cheese. Cover and grill for 2-3 minutes more until tortillas are lightly toasted, veggies are hot and cheese begins to melt. Remove carefully. To serve, cut into quarters. USING CHARCOAL GRILL: Prepare veggies as above. Grill directly over medium coals for 6-8 minutes turning once. Prepare topping as above. Grill tortillas directly over medium coals for 1-2 minutes,. Turn, spread with mixture, and grill 2-3 minutes more. Bake a pan of polenta until it gets crispy at the edges, and then top it with anything your heart desires. Here, roasted summer vegetables pair with fontina, a mild melting cheese. But this is a fantastic recipe all year long: try it in the fall or winter with butternut squash, mushrooms and Gorgonzola; serve with a salad of field greens. Preheat the oven to 450°F (230°C). Oil a rimmed baking sheet and an 8-inch (20-cm.) baking dish. In a large bowl, combine the eggplant, zucchini, summer squash, red onion and bell pepper. Drizzle with the 3 tablespoons oil, season with salt and pepper, and toss to combine. Arrange in a single layer on the prepared baking sheet. Roast, tossing once, until the vegetables are caramelized, 20-25 minutes. Set aside. Reduce the oven temperature to 350°F (180°C). Meanwhile, in a heavy saucepan, bring 4 cups (32 fl. oz./1 l.) salted water to a boil over medium heat. Stirring constantly, very slowly add the polenta. Cook, stirring constantly, until the polenta begins to thicken, about 5 minutes. Reduce the heat to low and continue to cook the polenta, stirring frequently, until the polenta is soft, about 25 minutes. Add the butter, Parmesan and fontina and stir until the cheeses melt. Pour the polenta into the prepared baking dish and smooth the top. Bake just until the polenta begins to set, about 15 minutes. Remove from the oven and top evenly with the roasted vegetables. Continue to bake until the vegetables are heated through, about 15 minutes. 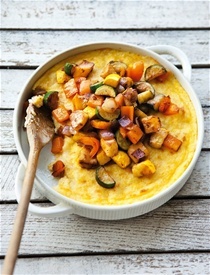 Serve the polenta directly from the dish. Next day, chop onion and peel garlic. Place both in bottom of slow cooker. Drain off beans, rinse briefly and add to slow cooker. 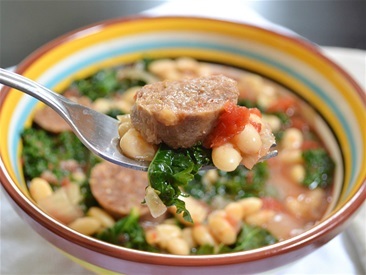 Place two sausage links on top of beans, add bay leaf, thyme, oregano, rosemary. Pour diced tomatoes and broth over top of all. Place lid on cooker, turn heat to high and cook for 4 hours. After 4 hours, beans should be tender. Remove bay leaf. Tera kale into small pieces and remove stems. Place torn leaves in colander and rinse well. Stir kale into cooker until it has wilted down. Remove the sausage, slice into pieces, and return to cooker. Add salt and pepper as desired.